Most powerfully, the benefit of investing in nonprofit infrastructure is that it allows the work of a highly motivated, highly creative staff to have a multiplying effect on mission. As nonprofit leaders, we can get ahead of ourselves for all the best reasons. The enthusiasm that drew us to the sector often motivates us to start new programming or take on more clients or advocate for one more cause before adding the extra resources we need to support our organizations effectively. While our zeal and hard work create forward momentum, we sometimes unintentionally hamper our own efforts by failing to first invest in our organizational infrastructure (core mission support). And without knowing it, we inadvertently limit our most valuable asset as nonprofits: the extraordinary efforts of the human beings who are our staff and volunteers. Since this concept started on a whiteboard with a nonprofit client, I’m throwing in a bunch of graphs to help explain. 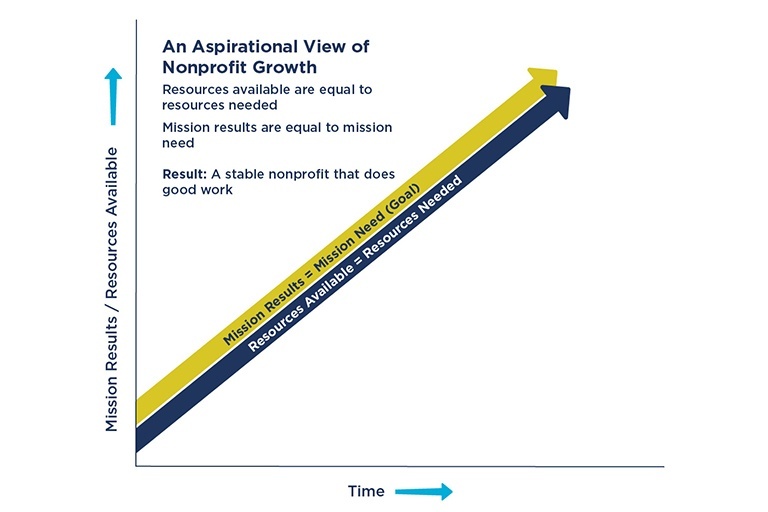 Figure 1 shows an aspirational view of nonprofit growth. 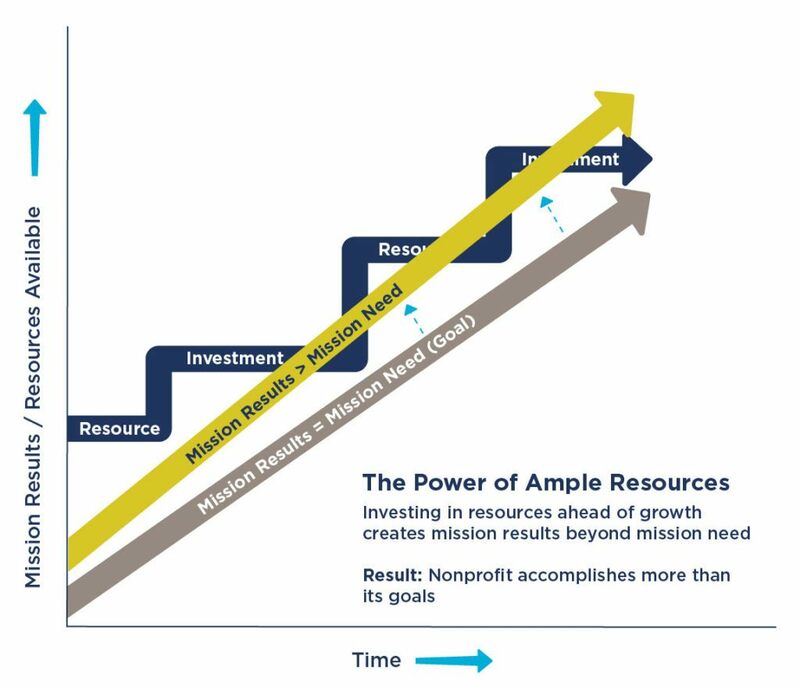 It assumes that as a nonprofit grows, its program successes (mission results) roughly match the resources it puts toward meeting those goals and expectations. This is an idealized view. 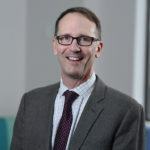 It assumes nonprofits really can have all the resources we need, provided we break out of the one-year budgeting cycle, add investments in infrastructure to our fundraising and strategic plans, and put away our small surpluses into a “change fund” or other future-oriented reserve. But as we know, our program aspirations often outpace our resources. 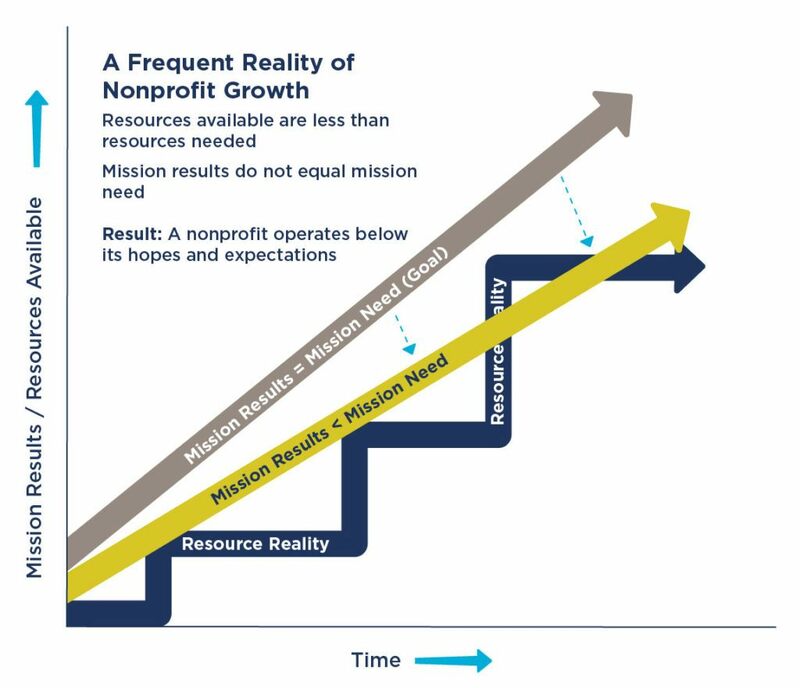 A frequent reality of nonprofit growth is represented in Figure 2. We add resources piecemeal – one development director or one CRM or one new computer at a time – many times long after the need first presents itself. When we let our investment in fundamental resources (core mission support) lag, it creates a downward force on program success. We become less efficient when we have inadequate IT, HR, finance, fundraising, marketing, and facilities to support our program work. For example, it is more difficult to track a trend in client health patterns using spreadsheets and paper surveys compared to an integrated CRM that allows accurate, timely data and open access. When we fail to provide our staff with appropriate technology, the weight of that decision pulls our program success downward. We can’t accomplish what we plan. Our mission results struggle to match the mission need. Under-investing in key infrastructure has a real effect on our organization’s ability to accomplish its program goals. But because our work is so important to us and to our communities, we try every means to ensure we deliver on our missions. 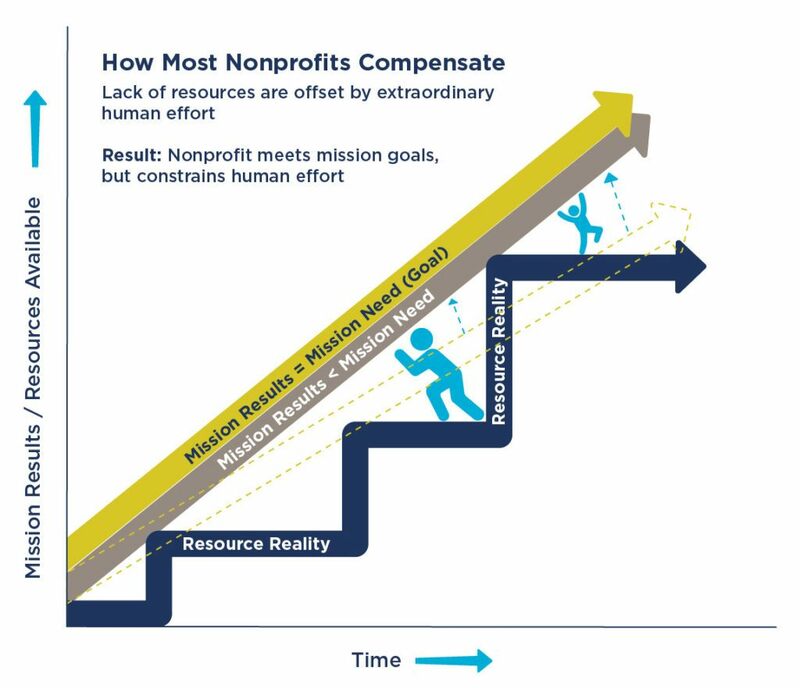 Figure 3 shows how the heroic work of nonprofit staff props up nonprofit mission when the resource reality is less than ideal. 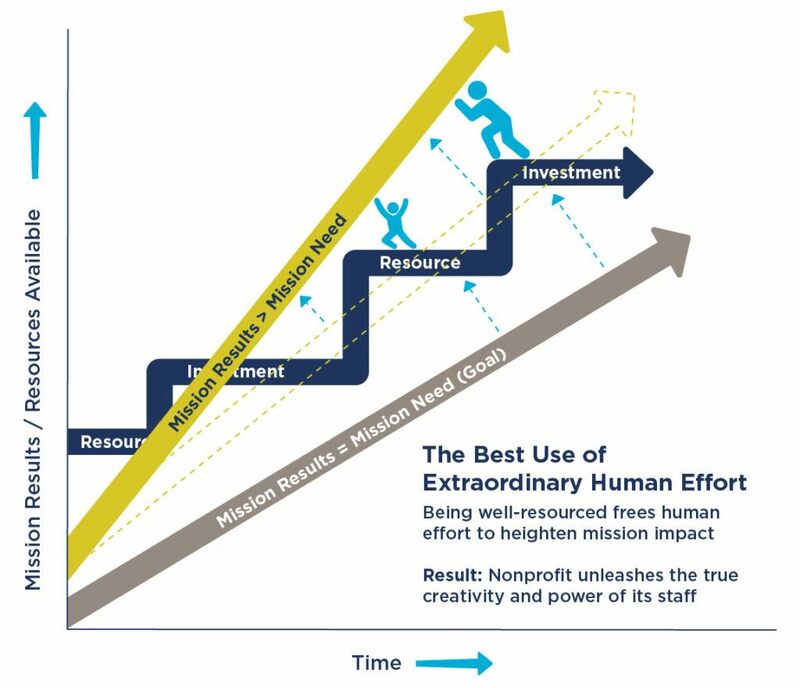 Nonprofits often compensate for a lack of investment in their organizational core by relying on the extraordinary efforts of human beings to serve our clients and further our causes. We sometimes support our staff with our praise, but too seldom with the resources that would sustain and nurture them – better health insurance; a fully financed diversity, equity, and inclusion committee; or a video conferencing system. Most nonprofit mission is accomplished by our staff; they are worth the investment. There is another option. If we shift our thinking and invest in our organizations ahead of growth, we can take advantage of the positive, upward force on mission that comes when our organizations are fully resourced. 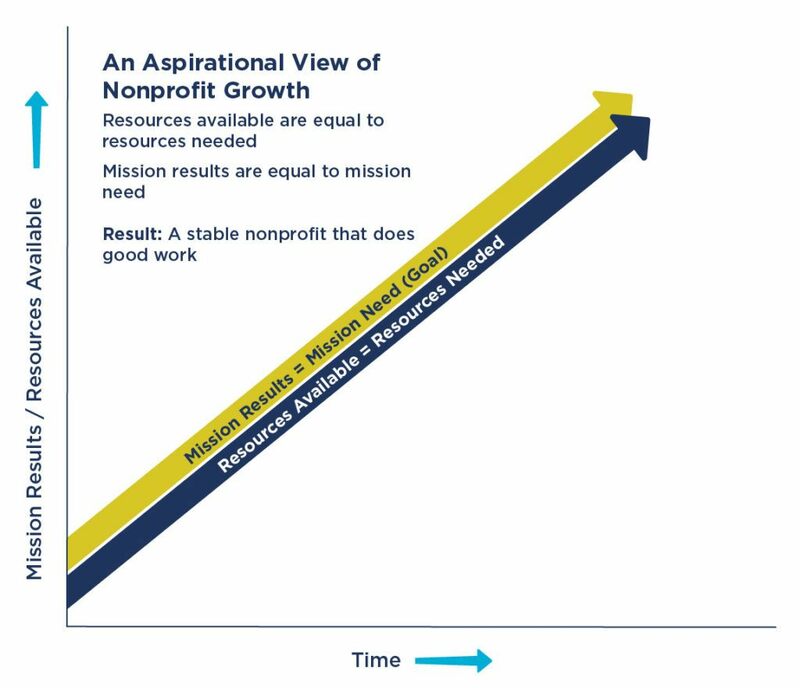 Figure 4 shows the natural upward boost that comes when we provide our organization with adequate resources before the demand becomes too great. Each step up represents a strategic investment in infrastructure – a high-speed printer, a human resources consultant, or an experienced finance director. For example, we can make our organizational leaders, our program managers, and our board members all more efficient and effective by operating a sophisticated accounting system that allows them real-time access to important financial dashboards, to review and approve expenditures from anywhere, and the ability to design reports that show the true costs of each program. Most powerfully, the benefit of investing in nonprofit infrastructure is that it allows the work of a highly motivated, highly creative staff to have a multiplying effect on mission. As Figure 5 shows, investing in infrastructure makes the best and most strategic use of labor that would otherwise be relegated to shoring up an under-resourced organization. When we support our staff with what they need, their work can become transformative rather than remedial. The hard work of nonprofit staff is then able to draw the impact of a properly-resourced organization far above its program expectations. When staff are paid well, have the right technology, enjoy access to great colleagues and networks, work in a creative office environment, and have talented human resource support, they accomplish more, have higher morale, stay longer, and help our organizations and our missions flourish. Investing in core mission support honors the extraordinary efforts of the already extraordinary human beings who are the heart of our nonprofit organizations.